Scooper - Technology News: Who’ll pay most for the clean energy revolution? Who’ll pay most for the clean energy revolution? The clean, distributed energy revolution is here. And it will be driven by a vast scale-up of energy storage and distributed solar. We need to vastly decarbonize electricity and transportation to slow global warming and its damage to our economies, health and standards of living. The good news is several technologies – cost-competitive, job-creating and economy-boosting technologies – are now widely commercially available. And in many US states, the “distributed energy resources” (DERs) experience is proving that private-sector developers, customers and investors are willing to share the costs – if customers are allowed to take greater control over their energy choices. Over the past 10 years, smartly designed incentive programmes jumpstarted a distributed solar revolution that has created enormous cost reductions and benefits for consumers and ratepayers. The massive success of the California Solar Initiative (CSI) is an excellent example. CSI was a $3 billion solar incentive programme for solar photovoltaics (PV), launched in 2007, which attracted private-sector customers. Their demand for rooftop solar ultimately created a tidal wave of systems across California that decentralized power generation. This market-transformation programme enabled small solar installers to grow into larger, cost-efficient regional and national players, building plants of 1-20 megawatts in size on the “utility side of the meter”. This and other solar policies were emulated in multiple states over the next decade, leading the US to generate 14.6 gigawatts of solar PV in 2016 and employ 260,000 workers. (This was up from 1.2 GW in 2007 and roughly 40,000 workers in 2007.) In sum, the California Solar Initiative became one of the most successful public-private partnerships in the history of US electricity. Worldwide, supportive policies for solar PV over the following years rapidly drove solar costs down. The cost to install solar in the US has dropped by more than 60% over the last 10 years, according to the Solar Energy Industries Association (SEIA), and global PV costs for even the higher-cost residential sector dropped by over 50%, according to the IEA. As a result, the global solar industry is shifting away from incentive support programmes to pure retail competition with utility electricity rates that rely more on private investment. Moreover, lower prices have emboldened policymakers around the world to set higher requirements for renewable energy, using scale to further drive down costs. In California and Hawaii, we are now seeing the same dramatic customer interest that we saw in solar PV — as well as a decline in technology costs—taking place in customer-sited energy storage. Commercial and industrial customers, who have been looking for greater control over energy decisions, now view energy storage as an automated way to reduce energy costs and better adapt to rate structures and policies that are changing rapidly. The desire of businesses and institutions to control when they buy electricity, in response to price signals is surging. Predictive analytics of energy demand, combined with storage solutions at the customer location, can greatly reduce peak-based capacity charges and other time-varying costs that can be up to 70% of the monthly electricity bill. Storage developers can then build an aggregated fleet (or a “virtual power plant”) of these distributed energy storage sites to provide additional services to grid operators and utilities. For example, the New York utility ConEd is using aggregated fleets of energy storage and other resources in the Brooklyn-Queens area to defer the need for a $1.2 billion distribution grid sub-station. Fleets of distributed solar, paired with storage, could also bid into wholesale markets as a clean capacity alternative to new transmission lines or extensions of fossil baseload generators. 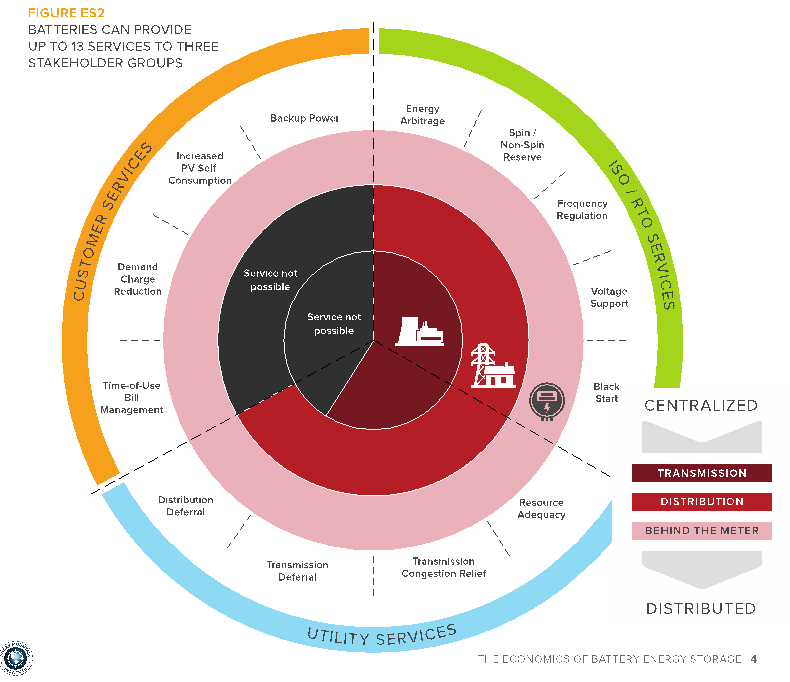 In fact, the US Rocky Mountain Institute illustrated 13 services that energy storage can perform nearly simultaneously for commercial customers, utilities, and grid operators. Energy storage thus uses the increasing demands of customers to control their energy choices for the good of the electric grid. With storage, the technology is particularly well-suited to a shared cost of deployment among customers, utilities, and grid operators because the individual value streams can be granularly quantifiable from a single system and provided to the multiple stakeholders. As a result, multiple parties are incentivized to provide capital or pay a portion of the cost of the grid. The energy storage space is seeing new business models and entrants, from software-only companies providing digitization to enable customer engagement, to the deregulated arms of utility companies as project developers. Moreover, energy storage can manipulate electric vehicle charging patterns to optimize against Time Of Use and demand charges in electric rates, in order to help decarbonize transportation. The growth of the storage and DER sector is forcing policymakers and utilities to engage in the necessary re-design of the regulatory paradigm, adopt new revenue models and planning of an electricity system around distributed energy resources and dynamic pricing. Customers are demanding more control and participation in grid services, and regulators and utility executives need to embrace new regulatory models to retain customers. If not, grid defection and stranded assets will be the unintended consequence.